Who: My sister-in-law is wearing her daughter, age 3 1/2, on her back and I am wearing my then 13 month old daughter. My older daughter, age 5, and her 6 year old cousin were hiking on foot. My husband and brother were also along for the hike. Where: We were in Yountville, CA (near Napa) at a small park with hiking trails. What: The scenery is so beautiful in this part of California. When driving down the winding roads, I am always struck by the desire to get out and climb the nearest green grassy hill. The weather was gorgeous when we woke up Friday morning, so I thought a hike was a perfect way to enjoy the day. A friend of my sister-in-law’s suggested this park and after looking it up online, I thought it looked like a nice gentle hiking trail that would be great for all of us. After making me do zumba earlier in the week, I wanted my sister-in-law to get a taste of my kind of exercise. So I let her borrow my Boba and helped her get my 3 year old niece on her back. It was her first time wearing her “baby” on her back and the foot stir ups of the Boba made it a perfect fit for both of them. I was wearing my baby in my standard size canvas Tula. The gentle hiking trail turned out to be a little steeper than we thought. It was pretty much an uphill climb up the side of a small mountain. It was definitely a good work out for all of us and the amazing view at the top made it more than worth the effort. Why: Pushing a stroller up what turned out to be a small mountain was not an option. Obviously the baby couldn’t hike on foot and the 3 year old would have gotten tired very quickly. Babywearing allowed us all to get some exercise and enjoy the beautiful day. Once we reached the top, the view was spectacular. 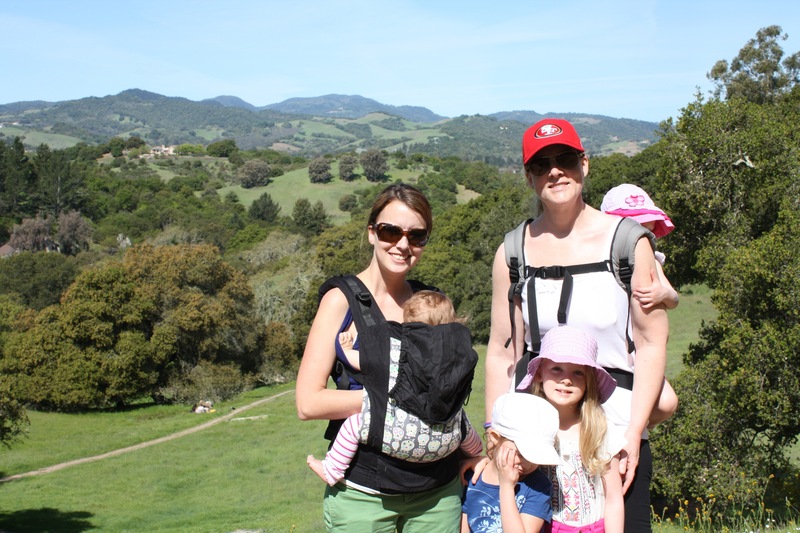 The two younger girls were able to take in the view from their babywearing vantage point. In addition, I did not have to stop and sit to breastfeed the baby. She nursed in the Tula basically the entire time and also a got in a great nap 🙂 It was a wonderful family day.